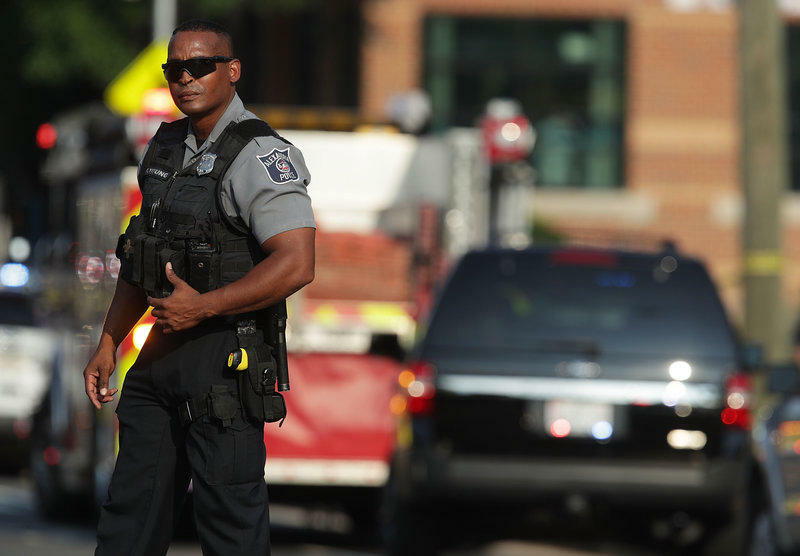 A police officer stands guard near the scene of a shooting Wednesday morning in Alexandria, Va.
Oakland county native Matt Mika, now a lobbyist at Tyson Foods, was reportedly shot multiple times. A statement from the Mika family reports that he is in critical condition and is currently undergoing surgery. House Majority Whip Steve Scalise of Louisiana was shot in the hip. His office says the congressman is undergoing surgery and is in stable condition. Rep. Mo Brooks, R-Ala., told CNN several other people also were hit, including two law enforcement officers. He said he saw the gunman holding a semi-automatic rifle in the area behind third base, and that Scalise had been near second base. The Alexandria Police Department has stated that the suspect is in custody. Police Chief Michael Brown says five people were transported to the hospital, including the suspect. The shooting occurred one day before the annual Congressional Baseball Game, which is scheduled for June 15 at Nationals Park. Pitting members of one party against another, the contest supports charities ranging from the Boys and Girls Clubs to the Washington Literacy Center. Rep. Bishop's communications director Kelli Ford said one staffer from Rep. Bishop's office was also there, and that they're currently on lockdown at the field as security sweeps the scene. Dismayed by the instance of violence at practice this a.m. for the Congressional baseball game. Prayers are with @SteveScalise and injured. I was on scene, but I'm blessed to be safe, and I want to thank the security forces who were so quick to respond. They're the heroes here. We're learning more about motive, but this is a good time to reflect on division and unity. We're all human. We're more the same than not. This morning, Rep. Moolenaar attended baseball practice. He was uninjured in the shooting. Please keep those injured in your prayers. The U.S. House of Representatives has canceled the day's scheduled votes and hearings. NPR contributed to this report. This is a developing story. Some things that get reported by the media will later turn out to be wrong. We will focus on reports from police officials and other authorities, credible news outlets and reporters who are at the scene. We will update as the situation develops. This post was updated at 1:15 p.m.